Integrative Therapeutics provides safe and effective supplements for conventional, naturopathic and alternative medicine practitioners. Their science-based top tier nutritional supplements are developed to bring together the best of science and medicine in order to aid healthcare professionals in their approach to restoring and maintaining health. Integrative Therapeutics™ believes in working with practitioners to provide a comprehensive approach to life-style driven care to empower people to take control of their health and wellness. Their evidence based approach and meticulous processes focus on the development of formulations based on research, ingredient testing, quality assurance and collaboration with their medical review board and a team of scientists, chemists and microbiologists. Integrative Therapeutics™ partners with raw material suppliers who share their passion for quality and consistency. All ingredients are validated for identity, safety, potency and bioavailability. In-house and third-party testing assures that products are free of contaminants, pesticides, heavy metals and microbial impurities. Their high quality supplements are manufactured in a state-of-the-art, pharmaceutical GMP audited facility ensuring identity, purity, strength, composition, accurate label claims and validated shelf life. 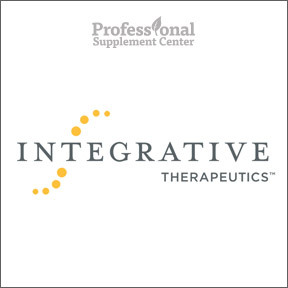 Integrative Therapeutics™ quality formulas are available solely through healthcare professionals. Cortisol Manager – Widely popular with our customers, this standardized proprietary blend of botanicals and stress-reducing adaptogens provides safe, natural, non-habit forming support for all-day stress reduction, balanced cortisol levels and restorative sleep without diminishing daytime alertness. Gluten and dairy free, vegetarian formula. Similase – This highly rated product provides a broad range, comprehensive, high potency, digestive enzyme formula that effectively supports gastrointestinal function under a wide range of pH conditions. Similase® provides support for digestion and assimilation of all nutrients, including protein, carbohydrate, fat and fiber and provides relief of occasional indigestion, gas and bloating. Wheat, soy and dairy free, vegetarian formulation. Probiotic Pearls – This 5 star-rated, science-based blend provides beneficial microflora to support healthy gastrointestinal and immune function. The patented delivery system protects the probiotics from heat, moisture, oxygen and stomach acid, assuring the probiotics reach the intestines for exceptional support. Gluten free formula. No refrigeration required, making Probiotics Pearls™ a perfect accompaniment for those on the go. This entry was posted in Home and tagged Cortisol Manager, Featured Brand: Integrative Therapeutics, Integrative Therapeutics, Probiotic Pearls, Similase. Bookmark the permalink.